The most important people in the airshow business are those who work behind the scenes to produce and staff the events and persevere the hardware. 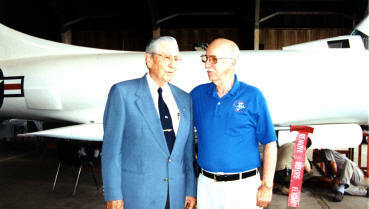 Floyd Wilson (right) with X-15 Test Pilot Scott Crossfield. Photo taken at the Carolinas Aviation Museum. (Left to Right) Piedmont Airlines Capt. 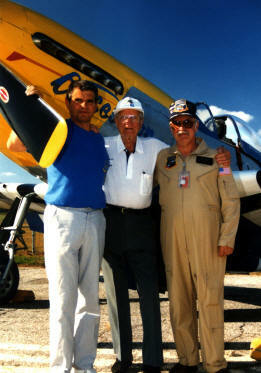 Jeff Michael, Col. Bob Morgan, pilot of the Memphis Bell, Floyd Wilson. Photo taken with Jeff's P-51 "Obsession." Col. Bob Morgan flies the B-17 "Memphis Bell" between the Asheville City Hall and the Buncombe County Court House departing his home town during the Bell's National War Bond Tour, 1943. 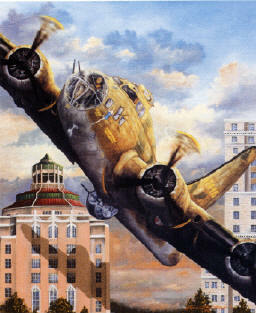 In his book "The Man Who Flew the Memphis Bell," Col. Morgan relates, "After dodging flak and Messerschmitts over Germany, flying a B-17 between the County Court House and Asheville City Hall was a piece of cake, even if I did have to bank the plane on a sixty-degree angle. Rattled a few windows, though." According to his wife, Linda, the buildings are 74 feet apart and the B-17 has a 103 foot wing span. Read the entire story, order the book!